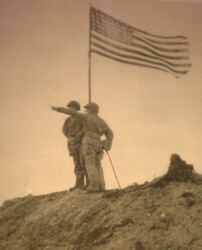 In this fateful year, not only the allies began to believe in victory just over the horizon, but their enemies were having serious doubts about their own potential for success. 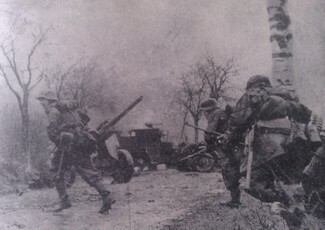 The Germans were severely battered on the eastern front. It was obvious that an invasion of continental Europe through France was forthcoming, and the Japanese were on the defensive against an aggressive U.S. island hopping campaign and a resurgent Chinese enemy. 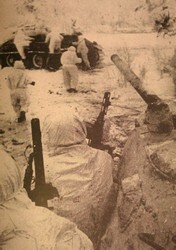 January 3: Red Army has forced the Germans into a 700 mile retreat from Stalingrad to the Polish border. 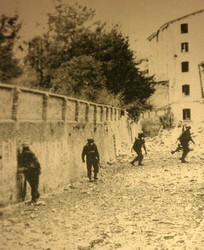 January: Canadians in Ortona, Italy hunt for snipers. 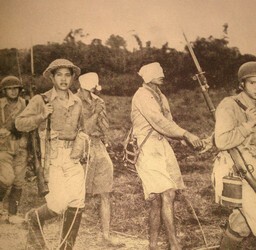 February 5: United States ally, China, captures and blindfold Japanese soldiers in Northern Burma. 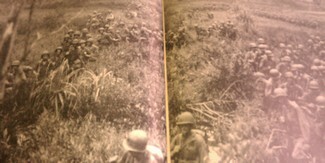 Chinese Nationalist Army trained by American General Joseph Stillwell. 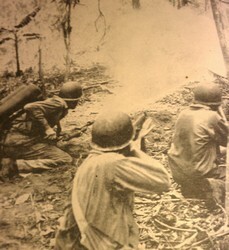 March: Fire fight on Bougainville (Solomon Islands). 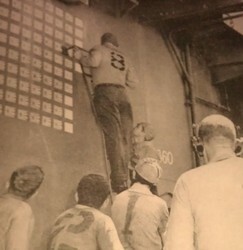 April 2: Japanese planes shot down by carrier pilots are recorded on ship's wall. 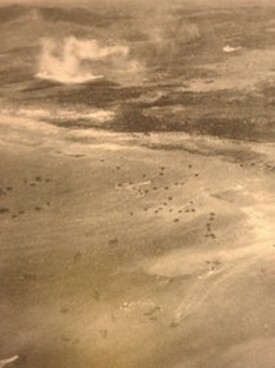 April 23: U.S. troops advancing on Japanese air strip Hollandia, New Guinea. 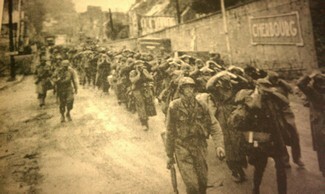 June 6: Allies land on Normandy beaches. 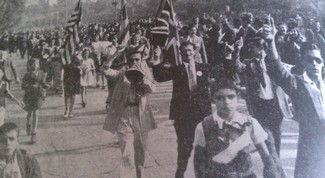 The invasion across the English Channel begins. 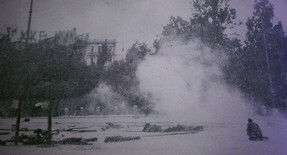 June 7: Second day of invasion subjected to German guns. 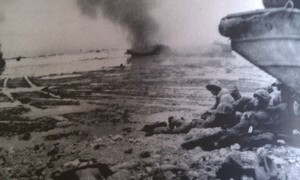 Landing craft sunk and rescued on a raft. 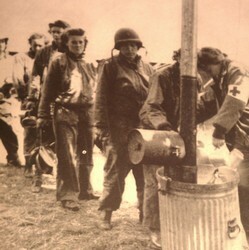 Wounded paratrooper, clinging to his cigarette carton, on the way to hospital ship. 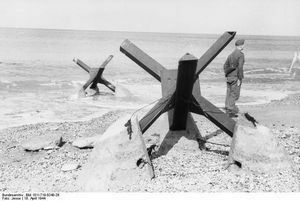 June: The obstacles that German defenders set up in the sea and on the beach to hinder off loading of tanks and vehicles prevent the cargo from reaching shore. 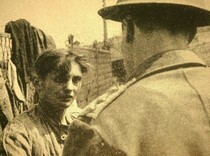 Seen here with German soldier on patrol. 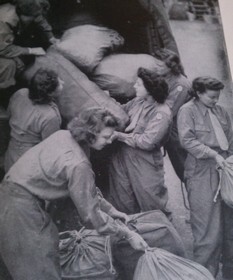 June: U.S. army nurses on shore in France. 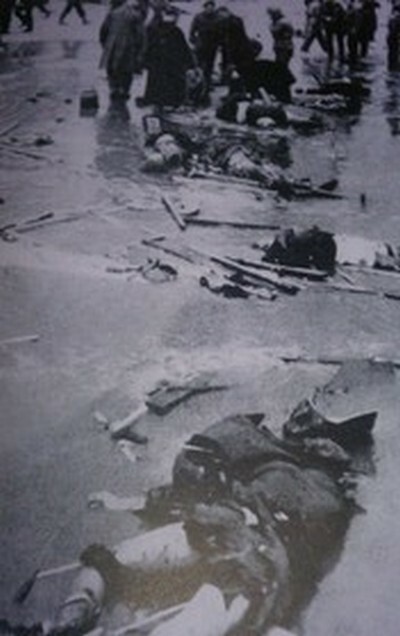 June 12: Carenton---1st French town to fall. 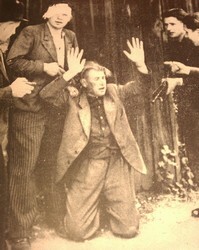 June 13: Reprisal: French kill former German employer, who during German occupation, forced civilian to labor for $1.00 per day. 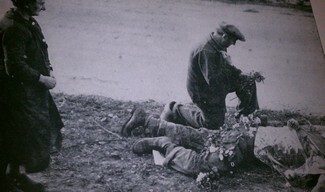 June 17: Frenchman and his wife pay tribute to fallen American with prayer and place flowers on body of American soldier. 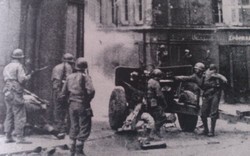 June 28: Cherbourg falls and Americans take prisoners. 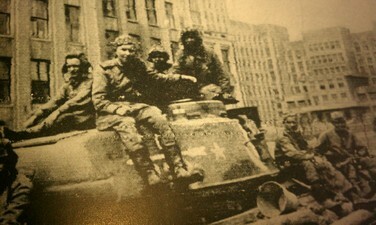 July 3: Red Army reoccupies Minsk--last large city in Nazi control. July 9. 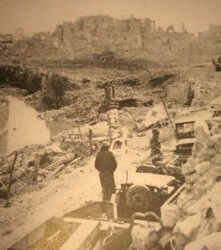 Caen falls to British and Canadian troops after weeks of siege. 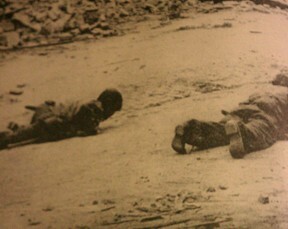 Their forces spot snipers and prepare a mortar barrage to dislodge them. July 13: A sad day. 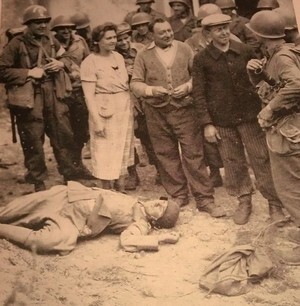 General Teddy Roosevelt Jr. dies in Normandy succumbing to pressures of an exhausting work load. 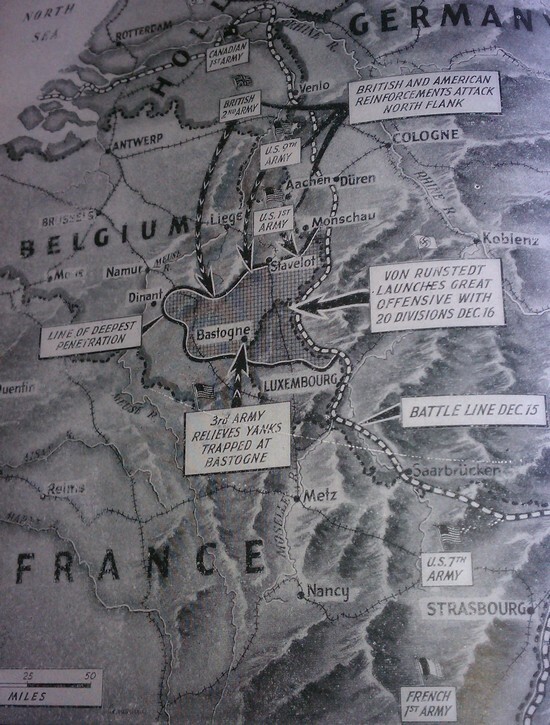 July 18: A week of hot fighting and Americans take St.Lo at western end of Normandy invasion line. 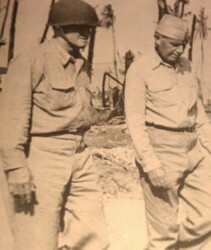 July 20: Americans hit Guam and recover the island by August 9 that had been a U.S. territory for 40 years prior to Japanese invasion of December 10, 1941. 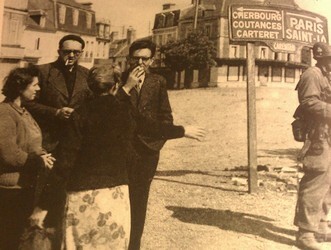 August 9: French underground, Maquis, capture collaborator. 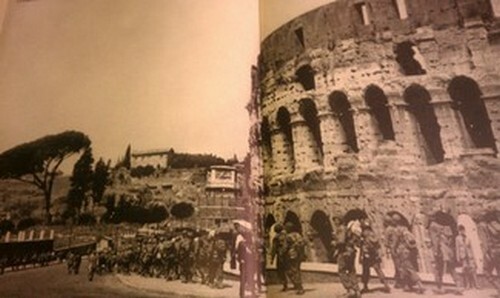 August: The Americans move into Florence. 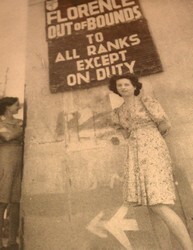 Sign is not addressed to any problem with Italian ladies, but presence of German snipers in the central city. 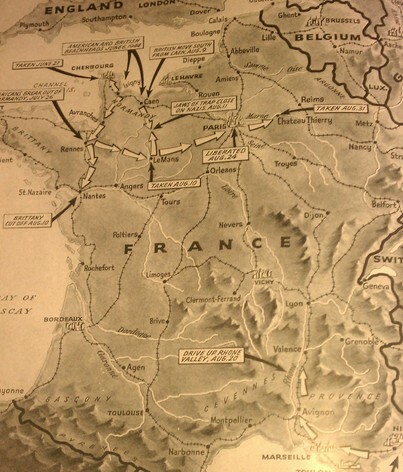 August: The shape of the war in France in the summer of 1944. 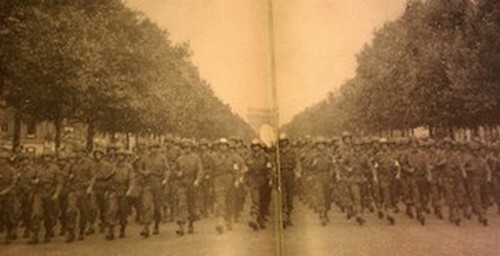 September 5: Americans cross into Belgium and liberate Brussels. 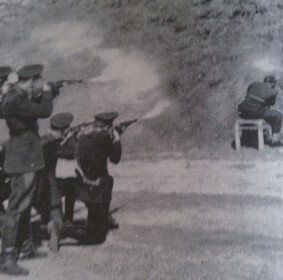 September: Italians execute Nazi collaborator. September: Three British paratroopers escape capture in ill fated, and poorly conceived, attack at Arnhem, Holland (Operation Market Garden). 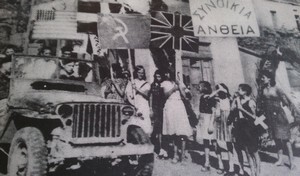 October 4: British begin liberation of Greece which was occupied at different times by armies of 3 Axis countries: Germans, Bulgaria and Italy. 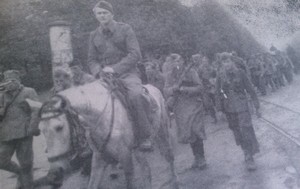 October: Red Army reach Czechoslovakian border in western advances against German army. 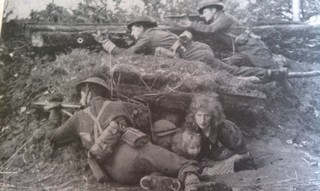 October: Family takes refuge in foxhole as British engage enemy at Hertogenbosch, Netherlands. October: General Tito's National Liberation Army liberates Belgrade, Yugoslavia. 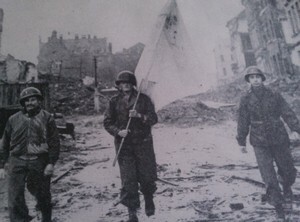 October 20: Americans, under white flag of truce, offer German commander of Aachen surrender terms: "surrender or die". No response resulted in 10 days of street to street fighting, and first large German city falls. 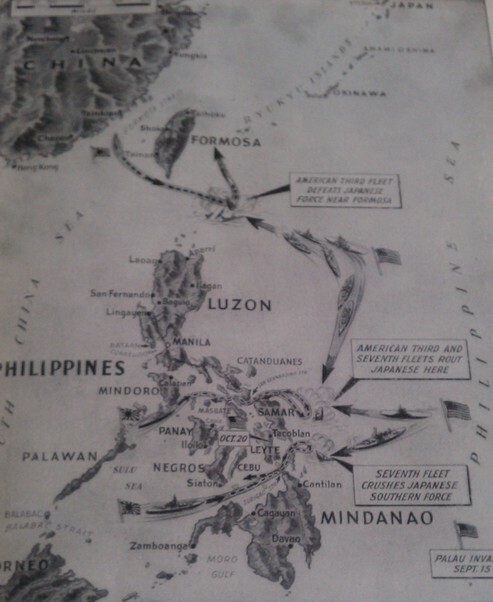 October: Second battle of the Philippine Sea. 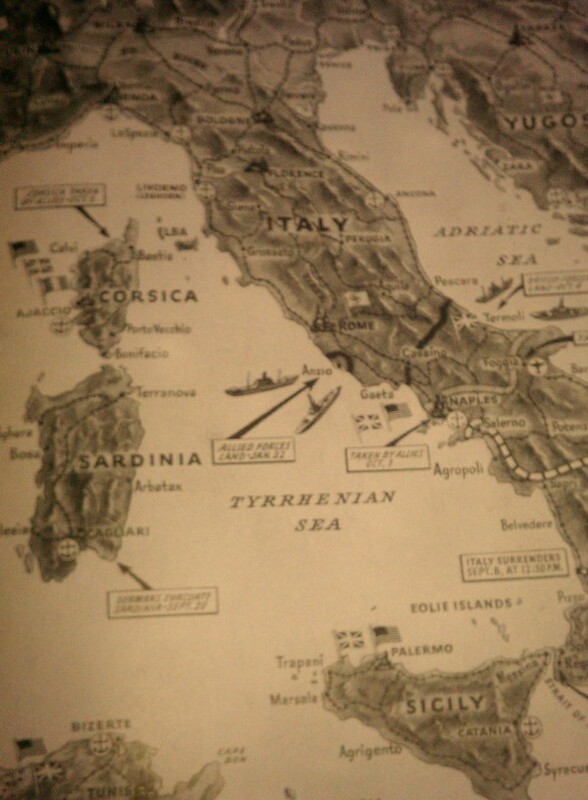 October: The Gothic Line was the German's last line of defense in northern Italy. 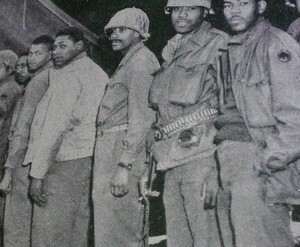 The all African -American 92nd division punched a significant hole in that line. 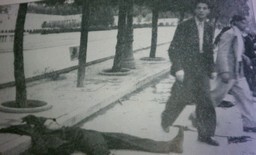 November: Civil war in Greece between communist and anti-communists engage in street battles in Athens. 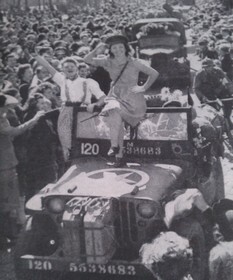 Hostilities end with armistice January 11, 1945. 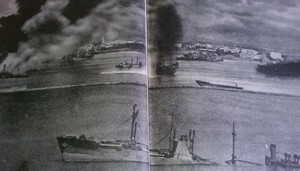 November 19: Americans strike Japanese ships in Manila. 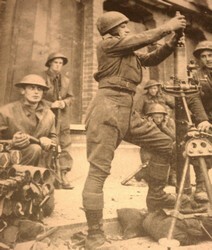 November 23: Free French artillery attached to U.S. 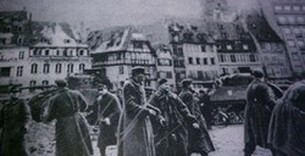 Seventh Army fighting to recover Strasbourg (Alsace area--eastern France), and German prisoners ordered to clear the rubble. 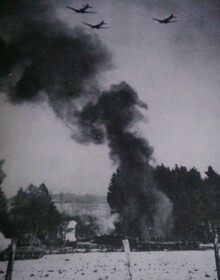 November: V rockets strike Belgian town. 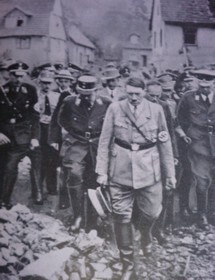 December: Hitler inspects wreckage of bombing attack in German town. 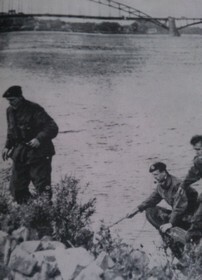 December: GIs hunt for snipers in northern France. 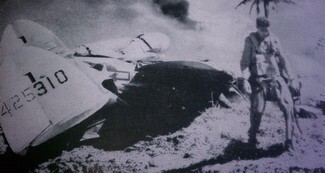 December 15: Pilot walks away unharmed from his P-38 shot down over Mindoro Island. 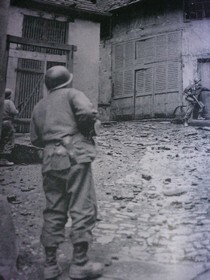 December 26: Supplies dropped for besieged Americans of 101st Airborne holding town of Bastogne where U.S. refused to surrender. C- 47s fly over active battle zone. 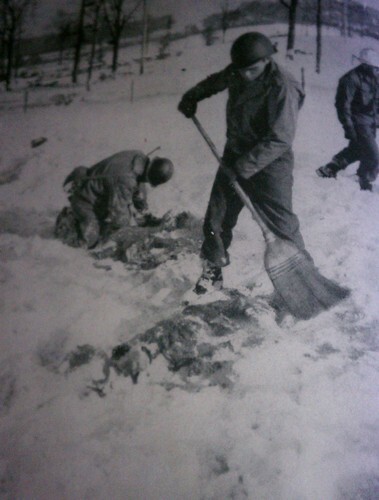 December: Malmedy Massacre: Americans uncover bodies of comrades held prisoners by Germans.